Flexible enough to work with your workflow. Whatever features you are looking for in a task manager, there’s a good chance we’ve got them. The Toodledo productivity system can be customized by enabling only the features that you need to create your most efficient workflow. The hotlist displays tasks that Toodledo thinks are the most important. It can be customized to contain tasks that are due soon, or have a high priority, star or status. Example: When I'm unsure what to do next I check my hotlist. Only have an hour available and want to make the best use of your time? The Scheduler will search all of your tasks and tell you which is the most important to work on right now. Example: I have 3 hours of free time at home. What can I finish in that time? The Batch-Edit tool will allow you to quickly perform the same edit on multiple tasks at the same time. If you have dozens of tasks that you want to edit simultaneously, this can be a big time saver. Example: Find all tasks that are overdue by 3 days and update them to top priority. Setting personal goals is a powerful way to direct your energy and determine what you want to achieve. When you complete a task that contributes to one of your goals, Toodledo will keep track of it with goal chains to help you stay motivated. Example: I completed 18 tasks this week that contributed towards my goal of "Get Enough Exercise". With a wide variety of options for importing, exporting or backing up your data, Toodledo will never lock you in. Easily switch to Toodledo by importing all of your tasks from other applications. Example: I can import my spreadsheets from work into Toodledo. Tags can be used as keywords to add a description to a task. You can use tags to classify tasks, and you can use filters to hide and show specific tags. Example: I use the tag "Taxes" to mark tasks that I will want to look up during tax season. Context is a concept that is frequently used by people who use the GTD methodology. Combined with filters this allows you to focus on the tasks that you can actually complete right now. Example: Don't show me tasks that have a context of @Work when I'm @Home. Subtasks are a convenient way to organize projects and tasks that have multiple steps. This helps you stay organized and keeps your to-do list less cluttered. Subtasks can be manually reordered, or displayed inline if you choose. Example: This large task can be broken down into 5 smaller steps. With Toodledo you can set tasks to repeat on any schedule. This works perfectly for weekly chores, or remembering birthdays. Completion can beoptional or required. Example: Get Gary a gift for his birthday by September 14th, every year. The star icon can be turned on or off to add visual interest to an item for any reason. It could be something that is important at the moment, something that is your favorite, or something that needs special attention. Example: My boss just brought my attention to this task. I'll add a star so it stands out. Prioritize your tasks so that they visually stand out. Priority helps determine what shows up on your Hotlist and lets you sort and filter out lower priority tasks. Example: Taking my son to the doctor is the top priority. Keep your projects in a pipeline by adding status. Track the current state of a task, and filter out tasks which have been deferred or set aside for later. Example: The status of this project has been put on hold. Share your tasks, lists and outlines with coworkers, friends and family to keep everyone productive and up to date. Collaborate on a project or assign tasks to work as a team. Example: This task is better suited for Omid, so I'll re-assign it to him. Show only the items that you want to see by filtering out those that aren't important right now. 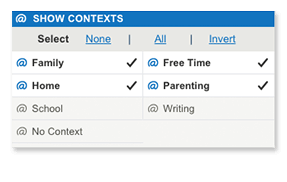 Filters can be applied to priority, due-date, context, tag and status. Reorder your tasks with up to three different sort criteria. With custom sorting, your most important items will always appear at the top. Folders are the most popular way to organize projects or areas of focus within Toodledo. You could create folders for general organization, or get specific. Example: The major aspects of my life are organized into folders: Ideas, Around the House, and Work. Add a reminder so that you'll get alerted before a task's due date. Reminders can be sent to a number of locations like your phone, browser or email address. Example: Send a reminder to my email 30 minutes before the big meeting. Ideal for: Remembering everything right on time. Specify a timeframe for your tasks by setting start dates and due dates. You can also add times, and reminders so you won't forget important tasks. Ideal for: Keeping a tight schedule! Toodledo's powerful search tools allow you to construct simple or complex search criteria to find exactly what you're looking for. Once you have made the perfect search, you can save it for quick access in the future. Example: Search all tasks that contain the word "Work" and are overdue. Toodledo's "Smart Add" functionality allows you to quickly add a task and it's details all at once. Simply prefix a /tag, /context, or /folder with a slash and Toodledo will figure out the rest. You can even add dates using plain language like "tomorrow" or "every other tuesday!" Example: "Check my /inbox at /work /every monday"
"He that would perfect his work must first sharpen his tools." "The less effort, the faster and more powerful you will be." "The bad news is that time flies. The good news is you’re the pilot." Working with a team? Check out our advanced subscription options.